One of the most elementary concepts we have learned about triangles in Geometry is the angle sum theorem. The theorem states that the sum the three interior angles of a triangle is . 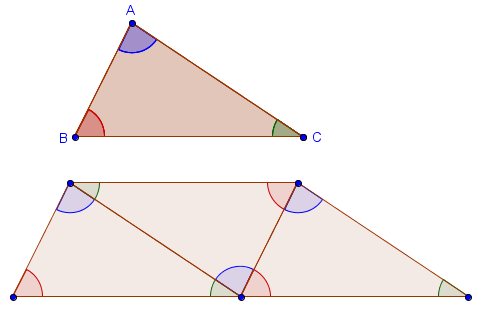 We can easily see this by duplicating or cutting the corners of a triangle and meeting the angles at a particular point (see first figure). 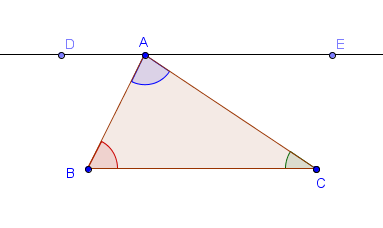 The adjacent angles will form a straight angle which is equal to . The proof of the angle sum theorem is quite easy. We just need to draw an extra line. The interior angle sum of triangle is equal to 180˚. Draw a line segment passing through and parallel to . This is possible because given a line and a point, you can draw exactly one line through that point parallel to the first line. Construct points and to the left and right of respectively as shown in the figure below. Now and are parallel, so and can be considered as transversals. since they are alternate interior angles. Also, since they are alternate interior angles. , , and form a straight angle therefore their sum is . Therefore, the interior angle sum of triangle is . « What are mathematical proofs, really?